The purity of the gold is stated as ‘percentage’ in chemistry, and it is stated as ‘carat’ in jewellry. According to this, 24-carat gold represents 100% pure gold, and 22-carat gold represents 91,6% pure gold. The 22-carat gold is integrated with 8,4% of other metals. The colour of the gold turns into greenish when silver is added. If nickel and platinum are added, the colour turns into white; if zinc is added, the colour of the gold turns into yellow; and if copper is added, the colour turns into a colour that ranges between yellow and red depending on the amount of the copper. It is impossible to find 100% pure gold, but 999,9% pure gold. Eighteen-carat gold contains 75% gold; and fourteen-carat gold contains 54,5% gold. If the supplementary metal is silver, the gold becomes yellow gold, known as green gold in jewellery. If the supplementary metal is copper, the gold becomes red gold. If the supplementary metals’ colours are whitish, the gold becomes white gold. 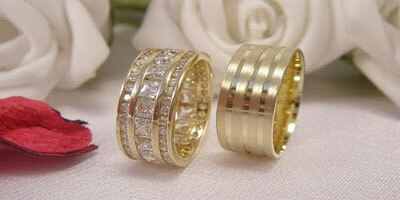 The white gold’s colour is broken white at the end of the production, it becomes pure white after covered with rhodium.